"While your compliments and positive feedback are very flattering, I cannot take full credit for the work I do! I see it as a partnership, a collaboration - your beauty, endless love, fresh ideas, and unique relationships give me the energy and inspiration to do great things. The final outcome of your wedding images is a shared vision that we cultivate together. If you are looking for the most amazing pictures of your special day, a photographer with a personality so unbelievable that you want to be friends with her in real life, and a great value for your money- Susanna is for you. My husband and I found Susanna on an article of the top ranked Cancun photographers, and knew within minutes of our first Skype meeting that she was the perfect fit for us. We just received our wedding pictures and we could not be happier. The quality, attention to detail and quantity of photos are more than we could have ever wanted. Susanna captured so many amazing moments that we will forever cherish with our friends and family. She also worked with us on pricing based on our needs and even fit us in for an engagement shoot while she was in NYC on business. Susi- we cannot thank you enough for everything and for the beautiful forever memories we now have of our wedding day. We hope to see you again very soon. Susanna did an amazing job! We were looking for something different than typical wedding pictures and poses. Susanna has a great eye and definitely delivered! Our pictures look like they were from a magazine. There are simply no words to describe Susanna Antichi!! Susanna was by far the best investment of our wedding and was the most perfect wedding photographer. From the moment we met her to discuss the day, we were confident she would capture it just as we wanted. She was professional and put us completely as ease. On the day itself, she blended in so well, whilst always being on hand to capture an image we requested. We've now received our photographs and we are stunned. She has exceeded our expectations and has produced amazing memories that we will treasure forever. We couldn't be happier, and wouldn't hesitate to book her again if we went back to do it all over again. She is amazing! THANK YOU SO MUCH SUSANNA YOU TRULY ARE THE BEST! Susanna was incredible. Her work was amazing and Susanna and her team were very professional and on point. During our wedding she came up with great ideas for photo shots and really capture the moment. I highly recommend her she is really amazing and does really incredible work. My husband and I had an absolutely amazing experience with Susanna! We are from Boston, Massachusetts and had a destination wedding in Cancun Mexico. From the first tim I was in contact with Susanna, she was warm and very responsive. In addition to answering my emails right away, we also set up Skype meetings where she quelled our concerns and answered all of our questions! She also made very helpful suggestions that truly made all the difference on our big day. For example, we had a set time in mind for the wedding ceremony to take place, and she proposed we have it a little earlier for the sake of the photos to have the best sun light. Something we had not even taken into consideration, and we are so glad we made the adjustment! She also recommended a videographer that she works with, and he was absolutely amazing as well! She had impeccable time management and arrived right as scheduled, Susanna kept the entire evening moving along smoothly, all while capturing our special moments! She gave superior direction to capture the best angles and the proof is in the proofs! (haha) Susanna and her team are true professionals who love what they do and their passion shows in the unique, beautiful photos they produce. We were truly blown away by our photos when we received our gallery and would recommend her to anyone!!! I am SO happy we get these photos for the rest of our lives!!! Susanna was by far the best purchase we made for our destination wedding. The quality of the photos were far beyond what I could have asked for. I look at others who paid twice as much for their photos and mine far surpass the plain,mundane boring old photos. (Biased I know!) After we received access to our online photos, I sent her numerous requests to have individual photos touched up (for ridiculous and vain reasons of course) and Susi did every single edit quickly and flawlessly. I wanted black and whites to color, wrinkles removed and arm fat "trimmed". She can do it all! Could not have found a better photographer! We had a geat experience with Susanna, she is very personable, professional and made us feel comfortable when she was taking our pictures. She worked hard in getting our pictures back fast and they arrived in a beautiful USB drive. Our guests loved her and were confortable with her. She is creative and has great equipment. Our sunset pictures and the way she played with the lighting came out so very good! Before we chose Susanna, we looked at a lot of other photographers websites to evaluate their style carefully. Susanna had a great balance between photojournalism and portrait shots! That is why we chose her! Susanna was truly a remarkable woman to work with!! She was not only extremely professional and accommodating (going above and beyond countless times to get the perfect shot!) but also a fantastic artist - the photos that she created were truly stunning. She was able to capture the essence of our wedding and has given us photos that are not only memories but alive with laughter, love and fun!! Also Susanna was also able to provide us with a sneak peak of our photos so that we were able to get our thank you cards sent out using these photos, which was a very sweet touch. Susanna was amazing!!! She was able to capture all our special moments that I will cherish for a life time. I can't say enough about her work I loved all of our pictures. She is very fun but professional at the same time! Quite simply, Susanna did an exceptional job photographing our wedding. We were impressed with the pics on her web site when we were researching wedding photographers, more impressed when we talked to her on the phone to make preliminary plans, continued to be impressed with her personality and calming nature when we met her in person, extremely impressed with how she conducted the photo shoots and beyond impressed when we saw the final photos! Susanna is not only easy to work with but fun to be around. She has the perfect personality for wedding photography. One of the highlights family members and guests mentioned after our wedding was how much they enjoyed meeting Susanna. She brings creativity, professionalism and passion to her work. Everyone who has seen our wedding pics has raved about the pics and photographer. We are thrilled with our choice of Susanna to capture our wedding memories. She will be fondly remembered for the rest of our lives. Susanna is AMAZING. We loved her SO much! She wanted our photos to be extra special, so she took us away from Cancun over to Isla Mujeres. The scenery at that island is much more majestic than what could have been captured in the hotel zone, which we very much appreciated. Susanna was always very responsive. That is actually one of the many reasons I chose her for our special day. She has a unique eye. If you want your images to be different than anything you've ever seen before, then pick Susanna. I guarantee you, your friends and family will be in awe of your photos. I can't say enough positive things about Susanna. We are overjoyed and couldn't be happier with how everything turned out. I cannot recommend her highly enough!!! Thanks again Susanna! Loovveeee Susanna!! Amazing work, great service. Beautifully edited photos. Every photo she took captured the moments that I will remember forever. Amazing Photographer. We could not have chose a better person to be taking our wedding pictures. She was just one person but the pictures make you feel like there were multiple people taking them at different times. I never noticed her taking the candid pictures either! Its like she just gracefully floated through the ceremony and reception with out any bother. I have fantastic pictures that will last a lifetime. So happy. The only tiny little thing I wish could've been different, was the family pictures didnt turn out great, very windy, so both moms are sad the pictures aren't great. Wish she wouldve noticed so we could retake them not on the crazy windy beach... oh well, life goes on! Also, Wish we couldve had a few more just face the camera and smile pictures. The pictures are amazing but very artsy, only like one or two of us actually just normal smiling at the camera. With those two tiny remarks, I would still use her over and over again. No one gets perfectly perfect wedding photos, and we have near perfect wedding photos!! Again, we are so happy we found you Susanna!!! Susanna Antichi is fantastic! We hired Susanna for our wedding and we have no regrets! At our first meeting (via skype), she was gracious enough to help us draft an early wedding day schedule and talked about the logistics of how the day would run in regards to the photography. She definitely helped calm our nerves over worries about the big day. During the meeting in Mexico ( the day before the weeding and trust me it was a very stressful day), she also showed samples of her previous work as well as answered all our discerning questions. She offered us exceptional value and she was very responsive in our subsequent communication and meetings. I was skeptical when Susanna told us that she was confident that she would be able to capture all our moments without any additional help, but she was right! On our wedding day, Susanna comprehensively captured all our candid and emotion filled expressions of us and our family and friends! We were so impressed on how she was able to capture such raw emotions of joy, love and even sadness! She stayed with us until the end!!! It seemed like she was also in two places at once! Susanna was also excellent at taking group photo shots. She was very professional, arranging people around and giving people direction to produce the best possible shot. The finished photos were personally delivered on-time. Susanna created the most amazing, classic photo albums as well as the soft copies on USB (along with a slideshow with music from our wedding!). She send us couple presents, such as calendar for 2016 and mini-albums. It was so kind of her…I just can’t say thank you enough for everything that she has done for us All in all, Susanna is passionate about her work. It felt as if Susanna was family at our wedding and it seemed like she was truly enjoying being a part of it. She was friendly and accommodating and I would recommend her to anyone without a doubt! Susanna is very talented and easy to work with ! I was nervous about booking a photographer I had never met for my destination wedding in Mexico. I wasn't extremely impressed with the photography included from my resort but with vendor fees it can be very expensive to find a independent photographer with a good portfolio. Susannas portfolio and reviews were good and her prices were very reasonable for the quality. She also got them to us on the mail on usb a lot quicker than I expected. Thanks again Susanna ! Susanna is an amazing photographer. After looking at her website, my husband and I contacted her and asked if we could video chat. She immediately set something up for us. Right away she made us very comfortable. She was extremely approachable, flexible and understanding with all the questions we had. I was very nervous about having a photographer who lived in another country (we are from New York, but planned to have our wedding in Mexico). Susanna was more than helpful during this long distance process; she stayed in constant contact with us through email, and even provided us with additional resources during our planning process. During her travels, she made a stop in New York and was able to accommodate an engagement shoot in Central Park for us. The pictures came out amazing, even more than my husband and I could have asked for. We were more than excited when it was time for the wedding. Susanna did not disappoint. She met with us a few days before the wedding to discuss last minute logistics. The day of, Susanna was right on time and my husband and I let her capture whatever she thought was best. We were so glad that we did because looking through our pictures now we are amazed at how beautifully Susanna was able to capture our day. Her pictures brought me to tears as she was able to capture the love, romance, passion, fun and once in a lifetime moments that we now can cherish forever. I am thankful for her services and would highly recommend her for any occasion. My fiancé and I were traveling to Playa Del Carmen for our November vacation. We at the time had been engaged for a few months and I thought it would be awesome to do engagement photos while we were in Mexico. I researched a few photographers and came across Susanna's website and loved her portfolio. I received a response within a few days of sending her an email. She sent me the quote and I immediately accepted. She was reasonably priced. I told her I wanted to do something romantic and out of our comfort zone. She suggested a sunrise shoot, she picked us up at our resort, and drove us to a nearby beach with Mayan Ruins in the background. She was so patient with us and taught us about the poses that she wanted us in. We received the images within that week and we were so pleased with the results. It was exactly what we wanted. Romantic and different from what we had been seeing from friends or online. I couldn't rave about Susanna more than I have already! She was awesome. Susanna services can be summed up in one word "AMAZING." She captured our love and passion for each other. First, she makes the time you spend together fun and relaxing. She truly has a special eye and talent to get great shots, making our day absolutely special. Second, she listens to what you want and makes it better, and she makes suggestions to get the best picture possible. Lastly, she was professional and punctual, we got our pictures a few weeks later. Most important my wife to be was extremely happy with all the time she spent with us and making us look better than we imagined. Susanna thanks again for the pictures, the video and all the love. Amazing- we loved her- kind, outgoing, accomodating, professional- we are so glad we chose her to be a part of our special day. We had a destination wedding and were unimpressed with the services adn related costs for the hotel provided photographer, so my wife researched and found Susanna. I was at first leary, depending on someone so heavily with very little recourse and no personal meetings until we were <1week from our wedding. in the end, she was great to work with; Susanna's pictures are amazing plus she was able to recommend a great videographer and a stellar set of musicians which we hired- all at a very good value. We recently received our photobook and am truly amazed at the beauty and quality of the entire presentation. I have no problem compeltely endorsing her and would absolutely refer any of my friends and/or family to her for captiviating photography. Susanna is the perfect photographer!!!!! My husband and I just loved all the photos!!!! Muito profissional, nos deixou muito à vontade para sermos fotografados, querida, simpática, sensacional! Melhor ainda foi ter entregue as fotos em apenas 3 dias! Sim, antes de viajar prepatou o pen drive com mais de 400 fotos e entregou em nosso hotel ainda durante a lua de mel! Amamos tanto a Susanna como as suas fotos e já estamos planejando mais uma lua de mel em algum lugar do mundo onde ela possa fotografar!!! Susanna is very professional, friendly and an excellent photographer. She made us feel special from the moment we contacted her for information on her services to the moment she sent us our pictures. After signing a contract with her we set up a Skype call since she wanted to get to know us a little. From the moment we talked to her we knew we had made the right choice. She was super sweet and showed interest in getting to know what we wanted and a little about ourselves. We had another meeting a couple of days before our wedding, just to finalize a few details and the day of our event she was punctual, kind and super patient with us and all of our guests. Our picture turned out incredible! Everyone that has seen them have commented on how pretty they look; we have even gotten comments saying that they are the best wedding pictures they have ever seen. Our pictures truly are gorgeous…we are thankful she was part of our story! Simply put…Susanna is an excellent photographer and almost a miracle worker! We definitely sort of decided to go with our photographer because she's from Siena, Italy and her photos looked pretty awesome on her site. We love our Italians! Little did we know, we met a permanent friend and artist who has a legit love for life and love. Mille Grazie Susanna Antichi! No tengo mas que decirte que wow! Quedamos encantados con tu trabajo! El album quedo precioso y nos gusto mucho la forma en que arreglaste las fotos. Nuestros amigos y familia nos han dado muchos cumplidos. Eres muy profesional y con gusto recomendaríamos tu trabajo. Agradecemos tu paciencia y dirección durante nuestra sesión ya que el resultado fue sin duda alguna excelente. Las fotos reflejan mucho sentimiento y serán un recuerdo invaluable de nuestra boda! Oh my God!!!!!! Today we have seen our beautiful photos. We are happy and were loughting for a long time like children, photos really cool and amazing. The pics are combined gorgeous colors, happy we and professionalism of the photographer!!! Filed unexpected moments, pictures are full of life and happiness. We are lucky to find such a great photographer and suggest for all couples to put the web-site www.susannaantichi.com in favouritеs!!! WOW-WOW-WOW!!! Hello, my favorite photographer! I’ve just received the package!Photos are perfect, like paintings! I am so glad, that we had chosen Holbox Island for location, it is really paradisiacal place!Thank you SO MUCH for the Slideshow! The music is so romantic! Oh! I am crying! Thank you for wonderful memories!!! I have just spent few hours going over our wedding photos what you took from us. I can’t even express how amazed and happy we are from wonderful and beautiful job you did. ALL PHOTOS ARE AMAZING!!! These pictures are priceless and something what we will enjoy for a lifetime.When I started to plan our wedding and looking for the photographer, I saw your work and there were no question about it that I wanted you to be our photographer. From that moment when we met I knew that you would make our day special and so it was.You managed to capture each detail for us to remember and captured all the emotion we were experiencing that day. Pictures are amazing and absolutely beautiful.You are most gifted, talented, creative, professional, and kindest photographer. You have great personality and sense of humor and it was so easy and fun to work with you. You are passionate about your work and we can feel that and see it in pictures.Other day when we made trash the dress session on the beach and cenote was fantastic! Pictures are creative and unique. Session was so much fun and experience was fabulous in every way. I can’t wait to make it again next year in our anniversary!Thank you so much to sharing your gift with us. Ya recibimos Nuestras fotos de trash the Dress y quiero decir que realmente quedamos ENCANTADOS, tanto con las fotos como con la experiencia en general, nos divertimos mucho y Susanna es una verdadera fotógrafa que trata a sus clientes especial a cada uno y que tiene mucha creatividad y no se encasilla, disfrutamos mucho de la experiencia y las fotos Increíbles! There are lots of things you learn when you’re planning your wedding. 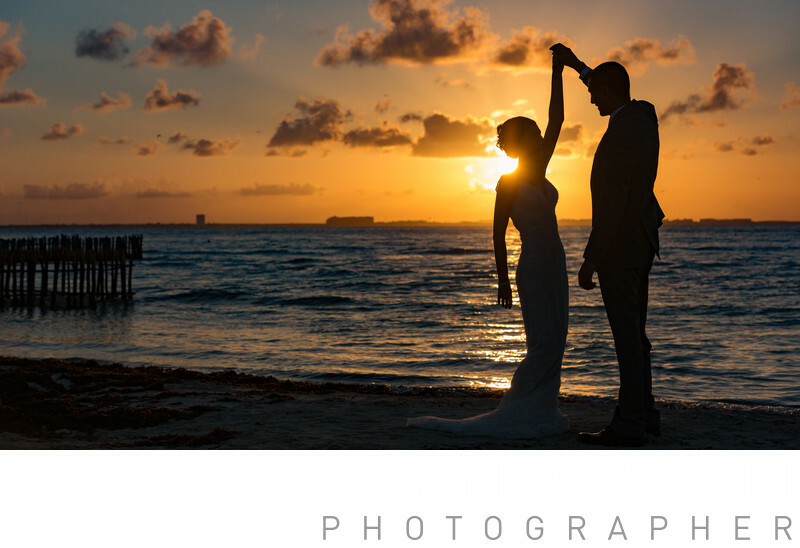 Choosing Susanna as our photographer was one of the best decisions we made, and we would do it again in a heartbeat!We planned our wedding in Playa del Carmen long distance, and we had to hope for the best when planning with everyone by phone & email. Susanna far exceeded out expectations in terms of her professionalism, responsiveness, friendliness, and, of course, with the photos!! !Susanna’s turn around time with the photos was excellent, even faster than she promised, and they were everything you would hope for them to be…the perfect reminder of the most important day of your life. Even now, months after the wedding, we are still blown away by the photos Susanna took for us.We hired Susanna for seven hours on the day of the wedding, and for a Trash the Dress session a couple days after. Susanna did an absolutely fantastic job working with us, our family, and our friends to catch all kinds of great shots. After the wedding, she posted photos for us in a cool app that made them easy to share with our guests. Everything was very easy and straightforward, and Susanna was as responsive after the wedding as she was before it.After you’ve gone through all the planning and had your big day, there are bound to be things you wished you had known beforehand or things you wished you had changed. What we wished we would had known beforehand is that working with Susanna is as close to stress free as possible…you’re in great hands with an amazing photographer, artist, and a really good person! We wouldn’t change anything about our experience with Susanna, and we highly recommend her to anyone that is reading this. Susanna will help you remember the best day of your life for all the years to come, and, for that, we can’t thank her enough! Te agradecemos infinitamente todas tus atenciones, eres una gran persona y excelente profesionista, has proyectado en nuestras fotos momentos inolvidables, gracias x ser parte de esta experiencia! My husband and I were searching for a photographer in the Playa Del Carmen area where we planned our babymoon vacation and amongst many options, we decided to book with Susanna. I was attracted to her work featured on her website (her images had an intimate vibe and I liked the coloring). When I contacted her, she was very friendly and communicated efficiently. We highly recommend Susanna Antichi as your photographer, our experience with her was wonderful. She went above and beyond to set the specific scene we were looking for and worked hard to help our vision come to fruition. Susanna has a passion for photography that shows up in her work and a real eye for great shots. She made us feel very comfortable and taking photos with her was easy and fun. We truly enjoyed our time with her and hope you do too!! I haven’t stopped crying tears of joy since I saw these photos Susanna!Thank you! Thank you! Thank you!You have captured the moments perfectly! My Husband and I had a fantastic time with Susanna as our photographer. She photographed our wedding ceremony and also she took us to a beautiful private beach. Her work is absolutely amazing. She is an exceptionally talented photographer, and I would not hesitate in hiring her again. Susanna was professional, flexible, and a pleasure to be around. She was very timely and punctual. We received the package with 4 DVDs in less than 2 weeks from getting home from our trip, while she was sending us photos immediately after the shoot.Susanna truly captured the emotions from the ceremony. She took some very unique photos that showed multiple perspectives of the ceremony in such beautiful ways. We appreciated the variety in the photos, from vibrant colors with beautiful contrasts to black and white with a soft glow to antique-esque photos . She captured it all. I can’t express how pleased we are with Susanna!!! Hola Susanna!Espero te encuentres muy bien! Quiero agradecerte x todo, por el tiempo, la paciencia, dentro de la sesión y también para felicitarte por las tomas que realizaste…NOS ENCANTARON! y no solo a nosotros, no hay persona que haya visto las fotos y que no me diga que le gustaron. Están padrísimas! Gracias por dejar bellos recuerdos. Dear Susanna,We loved the pictures!!!! Loved, Loved, loved.Thanks for everything, the picture are awesome! You were very kind with us at all times and the results couldn’t be more beautiful!Thanks a lot! Susy estamos muy contentos con tu trabajo, muchas gracias por las fotografías. Gracias por haber entendido el concepto de fotos que teníamos en mente, eso es algo que a muchos fotógrafos les cuesta mucho trabajo, en tu caso todo perfecto! Teníamos muchas opciones de fotógrafos pero definitivamente tú eres la mejor. Te recomendamos completamente, fue muy divertido trabajar contigo y definitivamente se ve que amas lo que haces por que se ve en los resultados. Gracias por tu paciencia y por habernos acompañado en el día mas importante de nuestra vida. Gracias! Definitivamente estamos super contentos con esta sesion de fotos, Susanna gracias por plasmar nuestra alegria y amor en estas imagenes, que sin duda reflejan la pasion que tienes por la fotografia, gracias por esos momentos en los cuales nos divertimos mucho, gracias por tu entrega, tu paciencia e imaginacion para que todo saliera hermoso!!!! nos quedamos mas que satisfechos con tu trabajo y el trato que nos diste, todo esta Genial! Agradecemos con todo el corazon, tu paciencia, tus ideas, tu entrega para hacer de nuestros momentos una fotografia!! Nos divertimos muchisimo! Eliud sonrio muchoo y ami eso me encanto!! No dudariamos en volver a tener otra sesion de fotos contigo!! Te estamos super recomendandoo jaja todas las fotos estan super chidaaaas!!!! El video ya lo vimos mas de 10 veces y presumimos muchisimo el excelente trabajo que hiciste con estos excelentes modelos jajaja bromaa!! Gracias nuevamente por reflejar nuestro amor en fotografia! Quiero contar mi experiencia con Susanna, la verdad que nos sorprendio positivamente su naturalidad, amabilidad y trato cercano desde el principio, no dudó en reunirse con nosotros todas las veces que quisimos antes de la boda, para conocernos, entrar en confianza y contestar todas nuestras dudas e inquietudes sobre la sesión de fotos. El día de la boda se ofrecio a tomarnos fotos en el hotel, la terraza, en la playa antes de la boda, durante la ceremonia, después de la ceremonia, y luego de regreso metidos en la piscina del hotel! Eramos muy novatos como modelos de fotografia y nos dio siempre las indicaciones para posar de forma de sacarnos fotos espectaculares! Nos sentimos muy comodos y sobretodo nos divertimos mucho! No dudeis en contratarla, os tratara de maravilla y quedareis súper contentos con su trabajo! Ciao Susanna,volevamo ringraziarti ancora per il bellissimo servizio fotografico che ci hai fatto per il nostro matrimonio!! Le foto sono stupende, vere e originali, sei veramente un’ottima professionista!! Posare per te è stato molto divertente e alla fine nemmeno così difficile, come invece ci aspettavamo. Susanna is definitely the best photographer; she was the best investment of all wedding, she captured moments, not just images. She is more than a photographer, she became part of the family, our friend, and we will consider it for our upcoming events. I highly recommend her work, she work with dedication and love for photography, she is a guarantee, not just a wedding work. If you want passion and emotion in your photos, you have to hire to Susanna Antichi. Susanna and her assistant are fantastic. I haven't received my proofs yet but I saw some of the shots she took and they're gorgeous. I can't wait to see them. When they arrived at our hotel, my wedding party was fixing my hair so we were quite a bit behind schedule. They didn't mind and just took candid shots of us getting ready and laughed and joked with us. I felt bad for Angel as he was the only guy in a room with 8 women all in various stages of dress and hair/makeup. He took it well and didn't make any of us feel uncomfortable or awkward. I didn't really pay attention to them during the ceremony for obvious reasons but during our photo shoot they gave us many different angles and locations. I can't wait to see the proofs and would absolutely recommend them. We might not have exactly the right words to express how wonderful our experience with Susanna was! From the moment I heard her call my name on the streets of Playa Del Carmen, I knew she would be amazing. Her smile was so genuine and loving and wonderful and she made us feel at ease right away. Her instincts about the location for our vow renewal photo shoot were perfect and we are so glad we trusted her. During our shoot she made us feel comfortable and beautiful at all times. She was so excited for us that we became even more excited and our photos are even better for this. Susanna is an artist. Her photography is exquisite. I have never in my life had photos this beautiful and it isn't just because of us or the beauty of Mexico. It is because of what Susanna knows how to do with a camera. We could not be more thrilled with they way she treated us and with the outstanding quality of our amazing album. I want to renew my vows EVERY year and have Susanna take the pictures.